Search for the best flight prices from Manchester to New York. Compare prices, book today and save money with Manchester Airport. The City that Never Sleeps is the very capital of the modern world – an ethnic and cultural melting pot and legendary cinematic backdrop that almost defies description, it offers an unrivalled fusion of people, cuisine, culture and experiences, 24 hours a day. The city that never sleeps of course offers myriad wonderful places to sleep, from exclusive palatial luxury to cheap-and-cheerful, central options. The West Tower at ONE UN Plaza (One United Nations Plaza, Midtown East) has sparkling views over the skyline, while the central Michelangelo Hotel is a short walk from Times Square and has an opulent, vaguely Italian look. The Jade Hotel (52 West 13th Street) is a gorgeous boutique hotel in Greenwich Village, and another great choice is the Soho Grand Hotel (310 West Broadway). However, there are plenty of less expensive choices too, such as Nyma, the New York Manhattan Hotel (6 West 32nd Street). 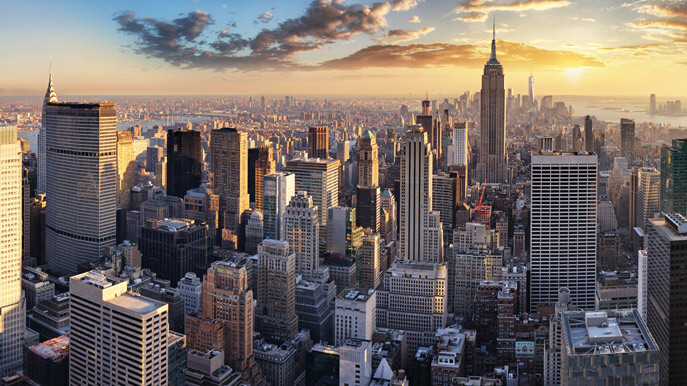 New York City is a mind-boggling place to shop, with an unparalleled choice of excellent-value electronics, clothing, trainers, cosmetics, homewares, and more. There are great department stores such as Barneys (660 Madison Avenue), Bloomingdales (504 Broadway) and Macy’s (151 West 34th Street), and glittering upmarket shops to die for along Fifth Avenue. You can search out bargains at Century 21 (22 Cortlandt Street and other branches) or discover something unique at myriad thrift and vintage stores. There are also thousands of beautifully styled individual boutiques; best areas to window-shop till you drop are SoHo, Nolita, Greenwich Village and the East Village. No other city does it better. You can eat practically every imaginable cuisine in New York City, from delicious and straight-up American fare in classic diners, to some of the finest sushi in the world, and from amazing Chinese food in one of the world’s greatest Chinatowns, to authentic Sicilian spaghetti in downtown Soho. You can eat fantastic cheap food, such as the world-renowned New York pizza, or the regional Thai of Pok Pok NY (127 Columbia Street, Brooklyn), or push the boat out at fabulous foodie addresses, such as French seafood restaurant Le Bernardin (155 West 51st Street), one of the city’s seven restaurants that has been awarded three Michelin stars. Co-founded by Robert De Niro, the Tribeca Film Festival is one of the world’s most famous film festivals. It offers a chance to see independent documentaries, features and shorts, as well as discussion events and more. Every year, the many museums along Fifth Avenue’s Museum Mile open their doors for free for a day, in a huge cultural celebration. Coney Island’s Mermaid Parade sees thousands of people dress up like fantastical sea creatures and parade through the streets, to welcome the advent of summer. It has taken place annually since 1983, on the first Saturday after the summer solstice. This 16-day extravaganza is North America’s largest arts festival, with more than 200 international companies performing at multiple venues across the city. Comedy’s greatest stars gather in the Big Apple to strut their stuff on the city’s most important stages. Expect names such as Sarah Silverman, Ricky Gervais, plus stand-up competitions and ensemble pieces. If you fancy taking in the Hamptons or making a trip Upstate when you head to New York, why not rent a car from the airport so you have the freedom to explore? Our handy car hire service allows you to compare 900 companies at over 50,000 locations so you can rent a car at a price that suits you. Book now.